This is a sponsored post written by me on behalf of Cooper Tire for IZEA. All opinions are 100% mine. To me, fall means lots of road trips. My kids don't get that much time off of school but what they do get, we plan for and hit the road to take some fun, weekend trips. This means the car has to be ready to go at all times. I check the tires and make certain that they are properly filled. I get an oil change and make certain that everything else has been properly checked as well. There is a lot of maintenance that goes along with car ownership and I don't want to take a chance that anything will go wrong while we are on our trips. My tires need to be just as reliable as everything on/in my car. You can now take advantage of everything the fall season has to offer by getting up to $70 back during Cooper Tire’s Fall Reward Event. Cooper Tire encourages smart savings year round with tips that can lengthen tires' lifespan, providing maximum handling, performance and gas mileage for vehicles. 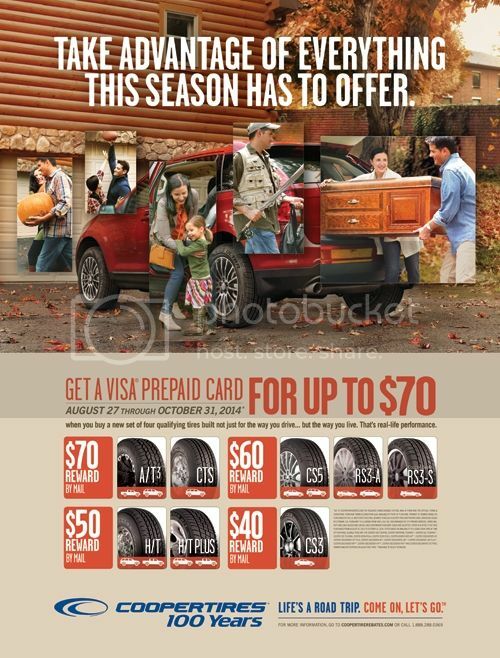 Now through October 31, with the purchase of a new set of four qualifying Cooper tires at participating retail stores Cooper is offering up to a $70 Visa® prepaid card on popular passenger and light truck tire lines. Cooper is also rekindling the spirit of life’s everyday road trips with their fun social media sweepstakes. Visit Cooper Tire’s Facebook, Instagram or Twitter page to post favorite moments of daily travels in the car, using the hashtag #RollWithCooper, for a chance to win ideal road trip prizes — including a $5,000 gift card to use toward gas, a winter car-care kit or a camouflage-themed prize pack. HOW CAN YOU BENEFIT FROM THIS PROMOTION?